And for the third year running, you can find such a market alongside the Thames between the London Eye and the Southbank Centre. It's an idyllic setting for a market like this, away from traffic and with the wonderful view along the river. It's also the perfect spot to meet some friends after work for a sausage snack and a mug of spicy mulled wine, and you'll most likely find a few stocking fillers among the many items on sale. Or take the whole family along, and round the evening off with a trip on the London Eye. Around 60 German-style chalets line the pedestrianised walkway, and you'll find other attractions there too, including a merry-go-round for the toddlers, as well as Santa's Secret Village, where kids can meet The Bearded One (that's Santa) to talk over their Christmas lists or just stand there and stare at him in awe. 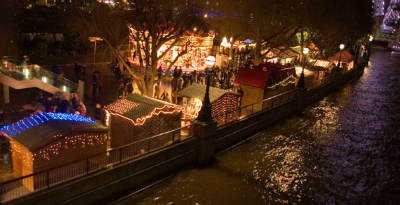 The Christmas market is running until the 23rd of December, so you've plenty of time to get along and enjoy the merry atmosphere. When: Until the 23rd of December. Mon-Thurs: 11am to 8pm; Fri-Sat: 10am to 10pm. Sun: 10am to 8pm. Where: Between the London Eye and the Southbank Centre.